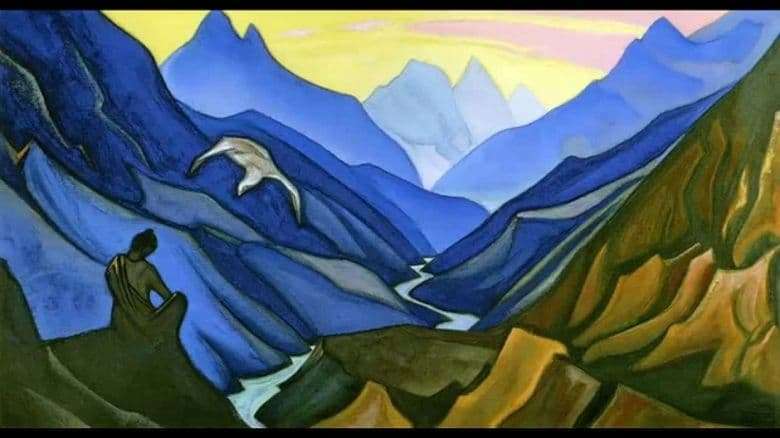 Nicholas Roerich was a very talented artist who tirelessly painted. On his very last day of his life, he worked on the painting “Teacher’s Order”. Earlier, in 1927, Roerich had already written the work “Teacher’s Decree”, but 20 years later the master rethought what he had written and changed the original version. Roerich, at the time of writing the picture, had not been in Altai for more than 20 years. But the native land attracted the artist. He missed his homeland and always considered himself an exclusively Russian creator. He embodied his love for Russia in this work. In this picture we see the Altai landscape. Cloth as if divided into two equal parts. On both sides there are high mountains, and a small mountain river separates them. The water still sharpens the stone, so this shallow stream was able to make its way through these stone giants. The foreground of the work also depicts mountains. They are lower than those that are far away, but they have their own peculiarity. On a small ledge is a young man. He is wearing traditional monastic clothing that covers his left shoulder. The monk is sitting in the lotus position, his head slightly tilted to the right. It seems like he is writing something. A little higher, a bird is depicted above the monk’s head. This is a white mountain eagle. It is not by chance that he is present at this work. This bird carries the good news to the monk. The teacher, the spiritual guide of this young monk, sent an eagle to tell a great secret. All the works of Nicholas Roerich are imbued with symbolism. The white mountain eagle is a symbol of good news, a symbol of enlightenment, goodness. He arrives in this world to give people peace. Wizard when drawing mountains uses soft smooth lines. There are no sharp kinks that are familiar to the rocks. Such a manner of writing creates the effect of buoyancy, instability of the Altai Mountains.